April 3, 2019 - The March, 2019 MLS® home sales statistics were released today by the Toronto Real Estate Board showing zero change in the number of properties sold compared to last March. Alright - one less property, actually, at 7,187. The overall average selling price of those properties was up one half of one percent to $788,335 from $784,514. Talk about “flat”. Sales activity actually increased nicely in “The 905” areas of the GTA outside Metropolitan Toronto. The latter appears to still be feeling the constraint of high prices and the double MLTT [Municipal Land Transfer Tax]. The statistics - based on sales reported by Toronto & GTA Realtors through the Toronto Real Estate Board’s MLS System - were released this morning in the Board’s monthly MarketWatch publication. Inventory overall - meaning all of TREB’s market area and all residential property types - dropped 2.5% to a total of 15,576 active listings. New listings were down 5.1% to 13,996 homes. All figures herein are year-over-year comparisons unless otherwise noted. Compared to February 2019 and it’s lovely weather, the number of sales was up 43% in March. March’s average sale price was virtually unchanged from February’s $780,397 though. Sales of Detached homes in Metro Toronto - “The 416” [Area Code] - fell 4% to 671 units at an average sale price of $1,267,598, down 2.1%. In the balance of the Greater Toronto Area there were 2,559 Detached sales, up 6.8%, averaging $910,624, down 1.2%. Condominium Apartment sales were negative to flat, off 14.1% to 1,349 units in T.O. at an average sale price of $603,969 and up 1.7% in the rest of the GTA to 616 units averaging $463,774, up 3.3%. The tight inventory situation in popular Toronto Condo neighbourhoods continues to constrict sales while giving some support to prices. All one-storey homes - be they Bungalow, Condo, or a “hybrid” of those [e.g. Detached Condo Bungalow, etc.] remained in strong demand as the population ages and as younger buyers find them - in the case of the first two, at least - attractive from both a price entry point and a future expansion/potential standpoint. Bungalows also tend to be more easily adaptable to adding an additional living space such as a basement apartment or "Granny Flat" / In-law Flat. Where permitted, these additional living spaces may be rentable, thus offsetting carrying costs. Townhome sales were also strong across the market area, up 15.2% in Toronto and up 11.1% in the rest of the GTA. The Indicated Forward Inventory [Total Active Listings / Monthly Sales] stood at 2.17 months - relatively low by historical standards - particularly for residential real estate in the month of March - and no doubt responsible to some degree for the market’s stability in terms of prices. In February ’19 there were 2.64 months of inventory, and a year ago there were 2.21 months. 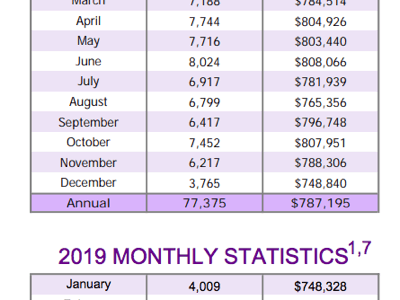 The Absorption Rate - the rate at which the market “absorbed” new listings [Monthly Sales / New Listings] was .51 - unchanged from February ’19; .486 a year ago. Homes took “5% longer to sell” this March averaging 21 Days on Market versus 20.